The Netherlands international nearly cost his side two points at Craven Cottage. The centre back's error led to Fulham's equaliser. LIVERPOOL DEFENDER VIRGIL van Dijk admitted his relief after his error saw Fulham equalise in Liverpool’s eventual win on Sunday. Following a scuffed clearance from James Milner, Van Dijk attempted to head the ball back to goalkeeper Alisson but left it short – allowing Ryan Babel to slot it past the Brazil international. That had cancelled out Sadio Mane’s opening goal, but Milner scored an 81st-minute penalty to give Liverpool a 2-1 victory. 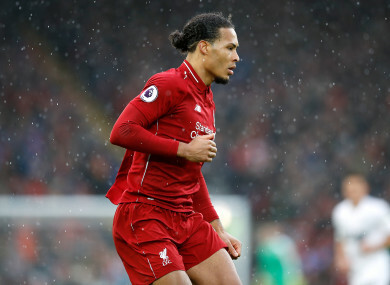 It was a rare mistake by Van Dijk, who has played a pivotal part in making the Reds’ defence the best in the Premier League this term. Speaking to Sky Sports , Van Dijk said: “We won the game. Mistakes happen in football and, obviously, a couple of things happen but it is what it is and we go again. The win pushed Liverpool two points ahead of Manchester City, who now have a game in hand after playing an FA Cup quarter-final tie this weekend, at the top of the Premier League. “We knew it was going to be a very tough game, especially second half,” Van Dijk continued. “We made it very difficult for ourselves. “We weren’t calm enough on the ball, we didn’t create too many options for each other. Van Dijk’s blushes were partially saved by 72nd-minute substitute Milner, who stopped Liverpool slipping up with his late penalty. Milner said after the game: “It was me who put him [Van Dijk] in the mire to be fair. The gaffer said to come on and calm it down so the best thing to do is to slice it over the top and put Virgil under pressure. “But luckily enough we got the result and did what we needed to do. What has gone before I feel is probably my fault. The goal is important and I put it away. Email “'I'm not giving excuses. I should've handled it better' - Van Dijk relieved after Fulham blunder”. Feedback on “'I'm not giving excuses. I should've handled it better' - Van Dijk relieved after Fulham blunder”.